We're on a mission to improve the lives of those in need by serving and directing resources towards the communities of the Dominican Republic with excellence and joy. Mission: Collaborating with institutions and generous individuals, who have the equipment or resources to donate. Through our collaboration with local hospitals, tech companies, other institutions and individuals, we are able to foster relationships that allow for continual flow of equipment and necesseties for the communities in the Dominican Republic. Mission: Organizing and facilitating the delivery of resources in the United States and around the world, to the impoversihed communities of the Dominican Republic. Thanks to our donor, we are able to facilitate the mobilization of the resources to the communities in need. Typically, we send 40ft containers of equipment ranging from medical, sport, and education. Mission: Providing resources, supplies, compassion, and energy to the designated community in the Dominican Republic. 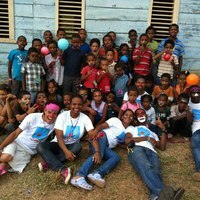 Volunteers from the U.S. and the Dominican Republic, work together in a designated community every Summer. Approximately 300 young adults and professionals participate in the mission. This is where the magic truly happens. To learn more about our trip and how you can participate, see below.